Plain black with white trim. 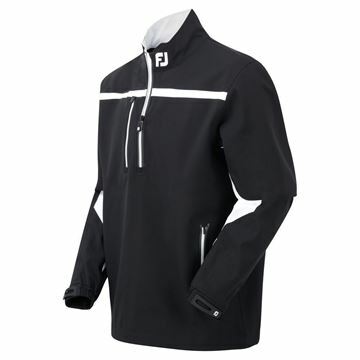 Fully waterproof jacket from Footjoy that is half zip. 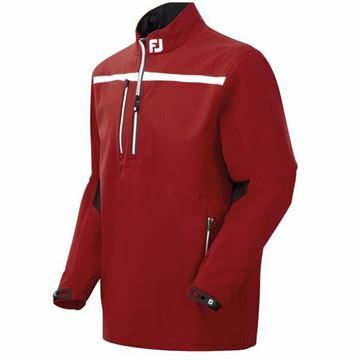 Breathable, lightweight premium quality waterproof for a great price! Fully waterproof half zip rain shirt. This jacket is lightweight, breathable and guaranteed to keep you dry without trapping your sweat like some waterproofs do. Fully waterproof half zip rain shirt. Bright red with a horizontal white stripe. Lightweight, breathable and guaranteed to keep you dry during a rainy day. DryJoys Tour XP Rain Shirts are constructed from advanced technology-packed materials that deliver 100% waterproof, breathable protection for golfers in cool, windy and rainy conditions. Make Every Day Playable with Tour-Proven FJ Outerwear. This waterproof system provides maximum protection in the toughest golf conditions, easily beads water and sheds it from the shell.